Develop social emotional and STEM skills in a collaborative, play-based environment with the IO Blocks Center. 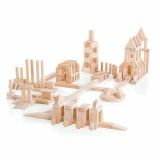 This all-in-one table brings movement, simple machines and dramatic play to the original IO Blocks friction-fit, construction toy platform. Combine gears, slides, IO people and standard IO Blocks pieces to create limitless builds using problem solving, introductory architecture and budding STEM skills. Constructions are stabilized on the raised grid tabletop while the sturdy birch plywood table features handy storage below to hold additional parts. Easy assembly- simply affix the table legs to the IO Bocks tabletop to begin limitless, educational fun. Dimensions: 31”L x 22”W x 23”H (79L x 56W x 58H cm). Ages 3+.